Note: Apologies in advance for the long post. This has been festering / brewing for a while and I wanted to get it right. In essence this post offers a tweak to the canonical TPACK image, explained in greater detail below. Note 2 (November 30, 2018). You are free to use the updated version of the TPACK diagram in your work under the following stipulations. First, you or the publisher do not make any claims to copyright over the image. Second, you use the language below to label / cite the image. 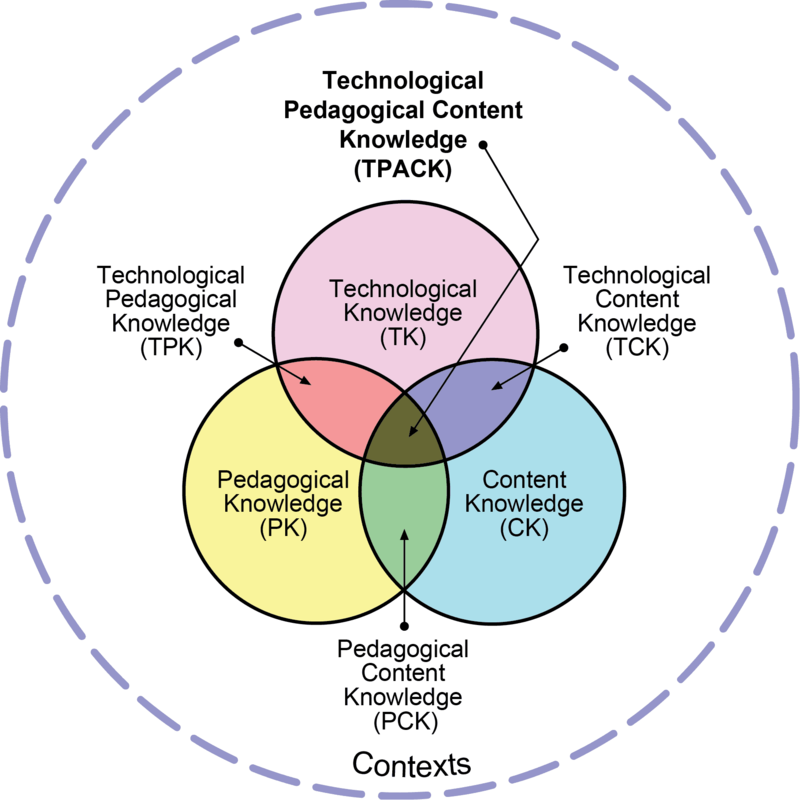 The TPACK (or Technological Pedagogical Content Knowledge) framework describes the kinds of knowledge required by teachers for successful integration of technology in their teaching. It was an idea that had been in the zeitgeist, so to speak, in the early 2000’s, with a number of scholars working in that space. Back in 2006, Matt Koehler and I wrote the key article in TCRecord that really put TPACK on the map.That article has over 7000 citations and Judi Harris, who maintains the TPACK newsletter, informed me that since 2009 there have been over 1100 journal articles and book chapters, almost 300 dissertations and 25+ books written with TPACK as the central theoretical construct. The TPACK framework has been called one of the most significant ideas in educational technology in recent history and has a huge influence on both research and practice in teacher education and teacher professional development across the world. All in all a pretty big deal. The framework is most easily recognized by the diagram given below. The TPACK image has pretty much stayed the same since 2009/2010, though to be fair there have been there have been some attempts to revise, reimagine, and redesign the existing model, some of which are shown below. That said, the canonical image is the one that has persisted, relatively unchanged, for a decade or more. What I am presenting here (in this post) is a tweak on the canonical image—a revision that seeks to resolve a semantic inconsistency in the diagram. This inconsistency has bothered me for a while, since it was first pointed out to me, many years ago, by a student at Twente University (sadly someone whose name I do not remember). The new version of the image can be found towards the end of this posting, but first the inconsistency and why the canonical image needs a (relatively minor but, I think, important) makeover. An enclosed space = knowledge. This why the overlaps (TPK, PCK, TCK) though not circles, can be considered as being knowledge as well—they enclose space! This brings us to the larger dotted circle, and the inconsistency. The outer dotted circle encloses a space but it is not designated as being a form of knowledge. It is just labeled “Context” or “Contexts.” Since TPACK is a framework for teacher knowledge, every enclosed space should represent some aspect of teacher knowledge. That works for TK, PK and CK (and the overlaps, TCK, PCK, TPK and TPCK) and should for the outer dotted circle as well. Of course, once this issue is identified, there is an easy solution. 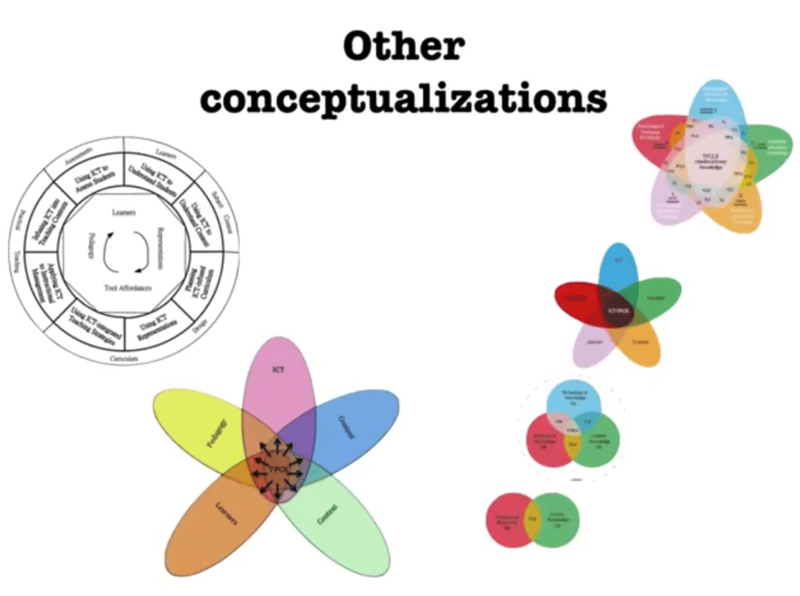 Just rename the outer dotted circle to be “Contextual Knowledge” (i.e. the knowledge the teacher has of the context), and then everything will be A-OK. Contextual Knowledge would be everything from a teacher’s awareness of the kinds of technologies available to them and their students; to their knowledge of the school, district and state policies that they have to function within. There is an added benefit to calling the outer circle Contextual Knowledge. Doing so makes the outer circle another key knowledge domain that teachers need to possess for the integration of technology in teaching. This, in turn, implies that contextual knowledge is something that we (as teacher educators) can act on, that we can seek to change, and something that teachers need to develop. Just as we seek to increase teachers’ PK, CK and TK and through that their TPACK, it becomes clear in this new view of the outer dotted circle, that we ought to work towards increasing their contextual knowledge as well. In fact, I would argue that contextual knowledge is of critical importance to teachers and the lack of it would limit, in significant ways, the effectiveness and success of any TPACK development program, or an individual teacher’s attempts at technology integration. This is not to say that researchers and practitioners have not paid attention to context – that is why that circle was added to the diagram. It is just that this nuance was not integral to the current representation of TPACK, hence limiting its application. Coming back to the representation. If we agree that this outer circle should be labelled “Contextual Knowledge” the question that arises is what its acronym should be. CK is already taken (for Content Knowledge) and adding another CK would be confusing. My suggestion is that we should call the outer dotted circle XK for “conteXtual Knowledge” allowing us to distinguish it from CK. 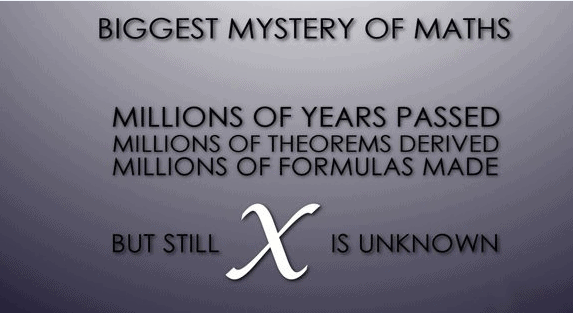 It is also cool, I think, to us X for conteXtual because X is usually used to denote a variable – which is what contextual knowledge often is—highly variable. So without further ado, here is the final (hah!) version of the TPACK diagram. Revised version of the TPACK image. Information on using in your own work and recommendations for referencing / citing given in note at the top of the page. The addition of XK to the diagram has another additional benefit. It allows us to highlight the organizational and situational constraints that teachers work within. Often the success of their efforts depends not as much on their knowledge of T, P, C and its overlaps, but rather on their knowledge of the context. This allows us to go beyond seeing teachers as designers of curriculum that apply within their classrooms but rather as being intrapreneurs—aware of how their organization functions, the levers of power and influence that they can engage with to effect change. This is XK – Contextual Knowledge. 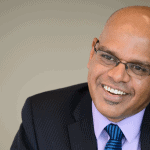 I could go on and on about this idea of intrapreneurship—in fact developing intrapreneurship is one of the key goals of the work we are currently engaged in at the Office of Scholarship and Innovation at the Teachers College at ASU. That, however, is a post for another day. Why not go ahead and use a Creative Commons License? I would suggest a CC-BY license, but feel free to take a look. I do use creative commons for some of my other work – just didn’t cross my mind for this one. Thanks for suggesting. Will this image be available to use under the same terms as the original at t-pack.org? 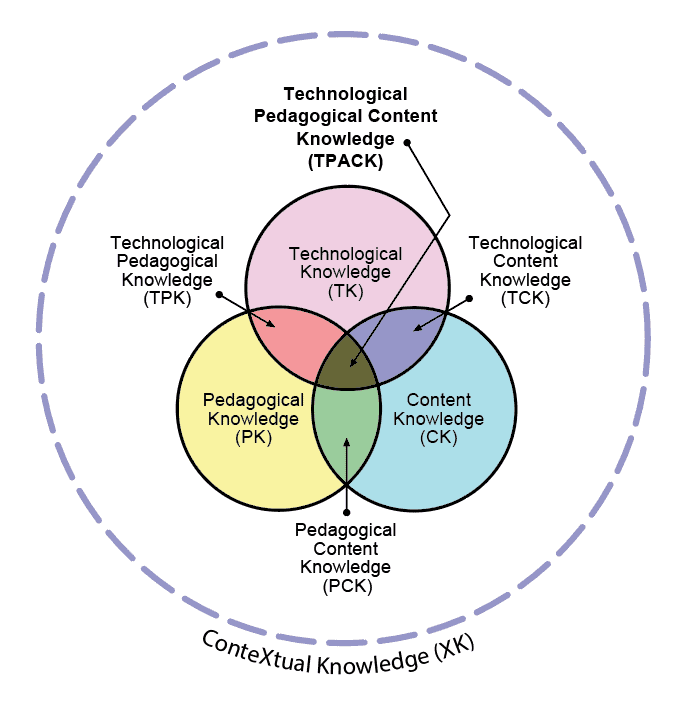 Emphasizing the role of XK or contextual knowledge is a game changer for TPACK Framework. Indeed, TK, CK, and PK are somehow “dependent” on the context where the teachers are situated into. This article is enlightening. Thank you.